With HIFF 31 now only a few short days away, the Red Band Project takes a look at our most anticipated films playing at this year’s fest. Culling through the 200 plus film descriptions, trailers, and blogosphere buzz on films playing in the festival does take some time so I’m breaking up this post into two parts. Part I (today’s edition) covers the 4th through 10th most anticipated films; while part II, which I’ll be posting tomorrow (hopefully), will cover the top three most anticipated films and a few other things you won’t want to miss at this year’s Hawaii International Film Festival. As always I’m going to preface this by saying that I’ve always been kind of a “mainstream” kinda guy so obviously I’m prone to being drawn to films with known actors in it or films that have high production value. Another caveat–some of the bigger “event” or “mainstream” films have been left off. 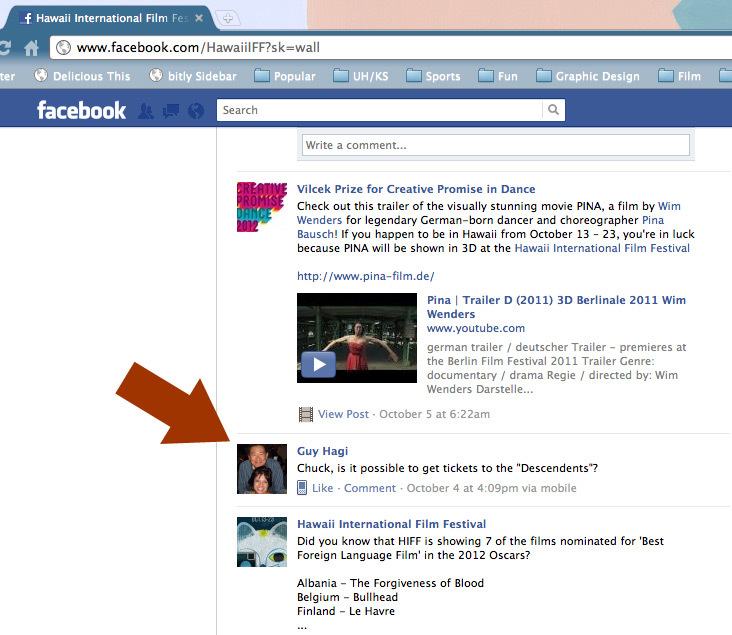 I mean, when even Guy Hagi wants tickets to The Descendants, there’s no need to cover something that huge. Finally, some of the films talked about or covered in this post may have already been discussed in previous blog posts (here and here). Please bear with me as I try to add more or slightly different insight as to why these movies are appearing on yet another HIFF blog post. And with that, here we go . . .
Stan Lee is the man that gave us Spider-Man, The Hulk, Iron Man, the X-Men, and a bunch of other really cool superheroes. He’s also the reason why we practically have a superhero genre for film today (which I personally think is a good thing). Now there’s no trailer and the movie descriptions about this film can only tell you so much, but having a documentary about the man is something that I can get behind and I’m sure would find interesting. I’m not a comic book geek so I only know the very basics about him. If this film can shed any light on what he’s like and give some insight into how he created these characters . . . well that’s good time spent in my opinion. I’m interested in seeing The Short List mainly because of the people behind it–TalkStory Productions. Last year TalkStory produced the film The Tempest, which played at last year’s HIFF and received a limited release in the US. The team behind TalkStory was on hand during the festival to do a Q&A and I was even fortunate enough to meet them and during both encounters I could feel how much they love cinema and the work that they do. This year they bring an anthology of locally shot short films to HIFF. While each one is different and unique, all have Hawaii written all over them. Also, this screening is already sold out and is at ‘rush line’ status. Guess it must be good if it’s already sold out. I’m going to assume that the music that plays in the first part of the trailer for this film was done by 9th Wonder himself. If that’s not the case, then I am going to be sorely disappointed when I see this film. That song was what basically sold me on the film. It’s mesmerizing, enchanting, and has a beat! And that’s not even the best part, that comes later when all these people (known artists included) wax poetically about how good the guy is. Needless to say if you’re a music person you won’t want to miss this screening or the special composers panel the next day (Saturday, October 15) that 9th Wonder will be at as well. Not going to lie, from the movie description and the trailer this film looks like a crazy good Hong Kong style action western. You heard that right, Western. It’s got everything a male ages 18-49 could ask for: explosions, chase scenes (on horseback and vehicular), shoot outs, oh, and don’t forget those slo-mo shots of bullets and arrows sailing through the air. What’s not to love about a movie like that? There’s definitely a lot to like in this film. The trailer, the film synopsis, having Chow Yun Fat starring in it, and the fact that it’s played at a number of different film festivals this year definitely all provide the ingredients for something great. The director of the film is also this year’s HIFF “Filmmaker in Focus” and they probably wouldn’t bestow that title on him unless his work is up to snuff. However, buzz from the festival circuit has been mixed at best with several film blogs warning about confusing storylines and a runtime that seems a bit long for what’s in the film. However, I did hear from someone locally that the film is “pretty f***en mean.” Whatever the case may be, I’m definitely interested to see what it’s about and am not discouraged by the lukewarm reception from the mainland. This film received A TON of praise coming out of this year’s Cannes Film Festival (THE highest profile and possibly most prestigious international film festival) and the lead actor, Jean Dujardin, took the Best Actor award from the festival. The film was picked up by The Weinstein Company for distribution in the US; so we will see it here in Hawaii before the end of the year. Though a lot of the buzz from Cannes has dropped off, the film still interests me since it’s a silent film. Yes, you read that correctly, there’s no speaking at all during the film! With so many peopling liking a silent film I feel I need to check this out. From the trailer, this film looks and gives off the same vibe as Saving Private Ryan. Just the scope and epicness of some of the scenes from the trailer give you that same feeling that you get from any great war film. It’s no wonder that The Front Line is Korea’s submission for next year’s Academy Award and will open HIFF 31 with a bang. So that’s going to do it for Part 1 of The Red Band Project’s HIFF Must See Preview. Check back tomorrow as I finish off the countdown, take a look at the films that just missed the list, films of note, and a bunch of events that you’ll definitely want to check out at this year’s Hawaii International Film Festival.